Noxudol 3100, 16 oz aerosol can, is a water-based, viscous elastic compound manufactured specifically to dampen unwanted sound and vibration. 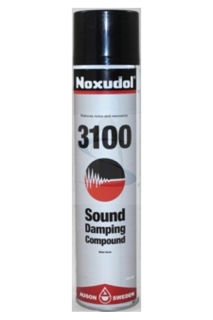 Noxudol 3100 converts sound energy into minuscule amounts of heat energy resulting in an overall noise reduction. In addition to its sound damping properties, Noxudol offers rust protection and is fire-retardant. Recommended use is to apply a 40 mils thick coat and a minimum of 3 coats. Estimated total thickness 1/8".